Rhinestone Cowboy Bolo Tie, German Silver cowboy boots with rhinestone boot bracelet & spur. 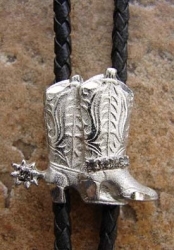 Rhinestone Cowboy bolo tie, German Silver cowboy boots with rhinestone boot bracelet & spur. German Silver tips, black leather strap. Approx. 1” wide x 1¼” long.